iTunes Home Sharing is a great way to share music libraries and playlists with others, but if you don’t want everyone to be able to sort through the shared library, you can easily require a password in order to access the shared playlists. This is perfect for situations where some content may be explicit and not appropriate for everyone to hear or see in your iTunes library, and it’s also excellent for when you only want to share and stream music with yourself from one computer to another, but you remain on the same network with others. Even for more mundane playlists it can still be a good idea to implement the password in multi-Mac households, offices, or schools, plus, you can combine it with sharing only specific playlists to hide that terribly embarrassing early 90’s music collection from everyone else in the office. 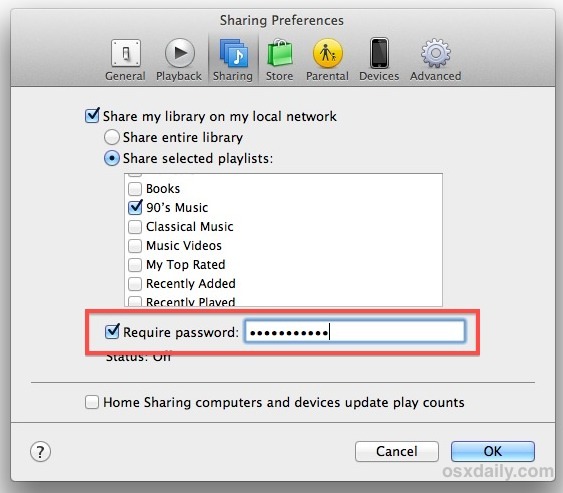 The next time someone goes to connect to the iTunes share, they will need to enter that set password to see and access the playlists or library. This applies to everyone, whether they are connecting from another Mac or PC running iTunes, or an iPad, iPod touch, or iPhone on the same network. I understand password protection does no longer work when home sharing has been enabled. The password protection works for me however only when homesharing has been disabled and then also just with another iTunes instance on another computer. iPhone/iPad wouldn’t recognise the shared library. Or have I missed here something? Would love to see an answer to this myself. The only way i can require a password is to turn off home sharing. Would be fine except the iOS devices no longer have access to the library at all.